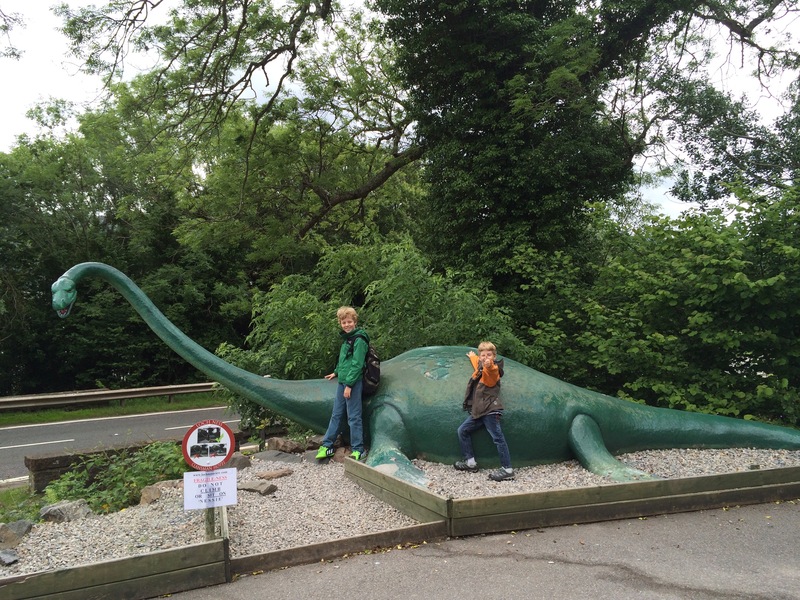 This is Part 4 in our visit to Scotland. 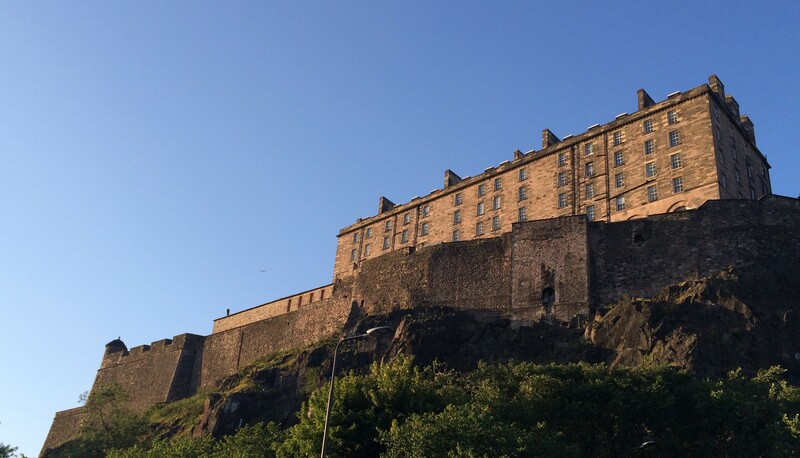 Over here you can find our visits to Part 1: Edinburgh Castle, Part 2: JK Rowling’s Scotland, and Part 3: Hadrian’s Wall. It’s almost a Scooby Doo title, isn’t it? But for us there was no mystery to solve and no Great Dane with the munchies, but there was perhaps a monster to find. 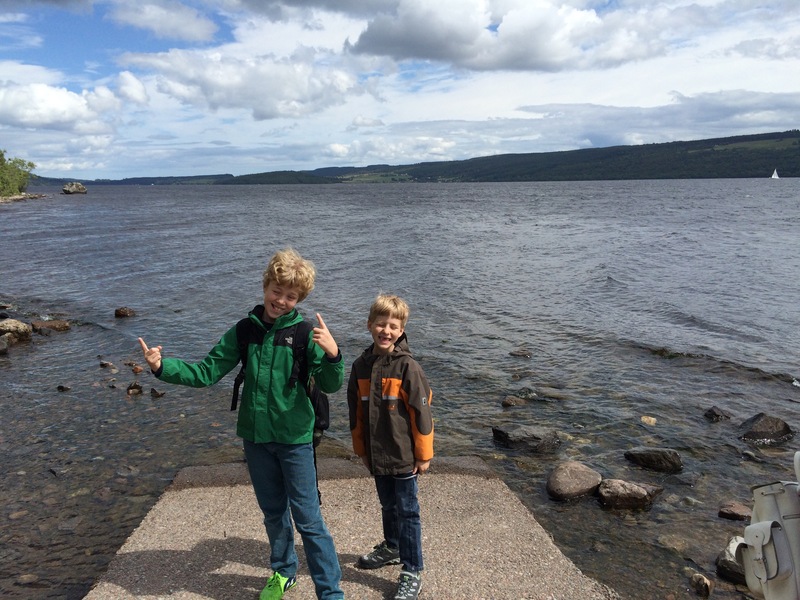 Loch Ness is waaaay up north by Inverness. This would mean several hours in a van and with a tour group. The boys were game for it. They brought books and coloring pages so they were good. I brought my camera and my excitement at going to a place I’d first heard about reading National Geographic. 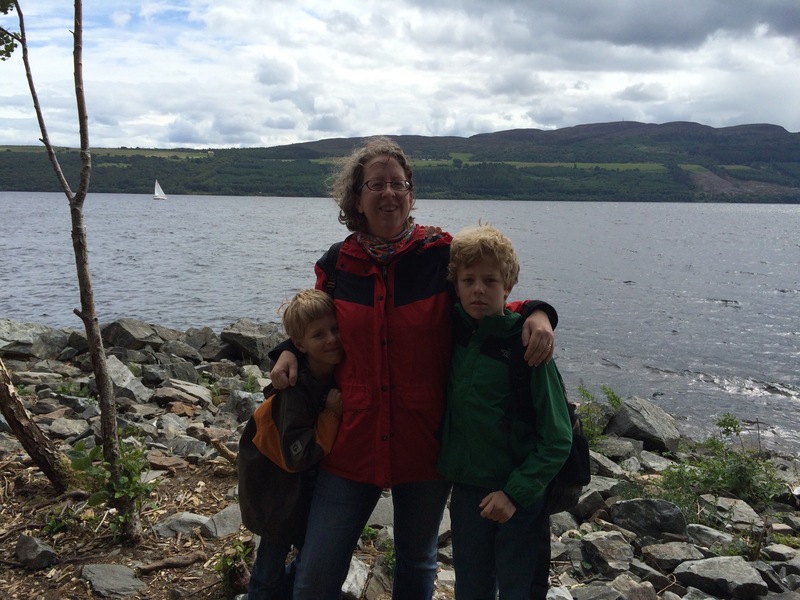 Loch Ness is the largest lake by volume of water because it is so very deep. It’s deepest point is 755ft. It goes from Inverness in the north until Fort William, a town just by Glen Coe, in the south. 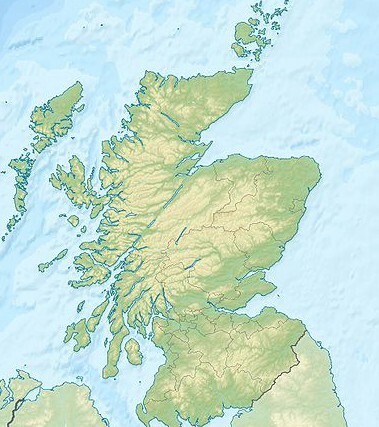 As you can see on the map, it looks like all the Lochs form a diagonal line across the country. That is the Great Glen Fault, a fault line between two tectonic plates. Yes, they have routine small earthquakes there. No, we didn’t feel any while we were there. These are totally my children. One of the first things you notice about the water is that it’s black. Black like tar. When it foams up you can see dark brown undertones to the water. It is not a water that invites you to swim in it, although some people do. 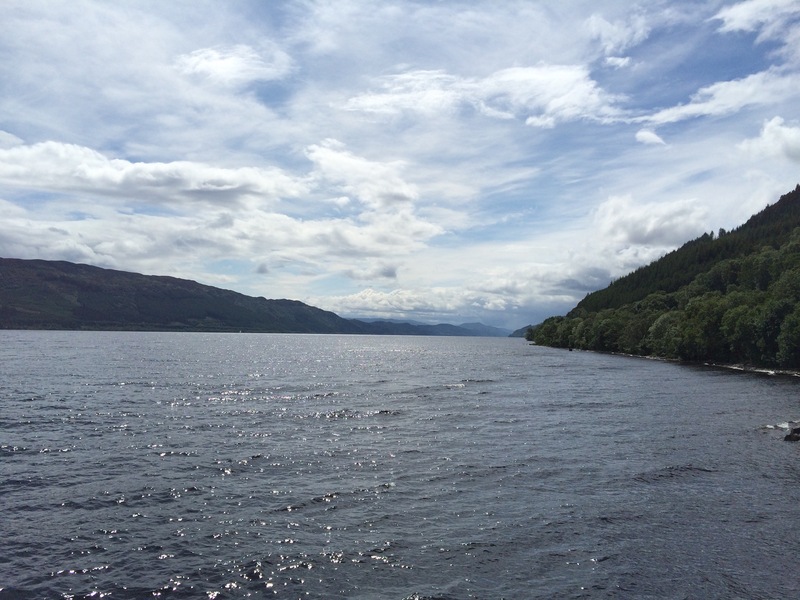 Loch Ness is absolutely beautiful. It’s quiet and lonely even with all the tourists around. The boat trip took an hour and we went to Urquhart Castle on the south end of the loch. 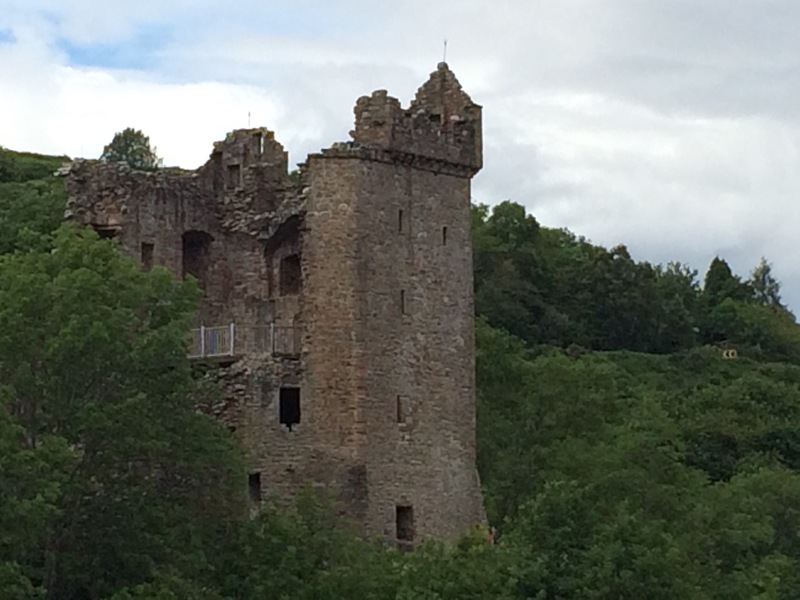 Urquhart Castle is a fascinating ruin. After James II was deposed in 1688, the Jacobites used Urquhart Castle as a base for a rebellion. The English, of course, attempted to capture him and the Jacobites. Seeing that they were going to be the losers, the Jacobites blew it to pieces in 1692 to prevent the English from taking it and using it themselves. 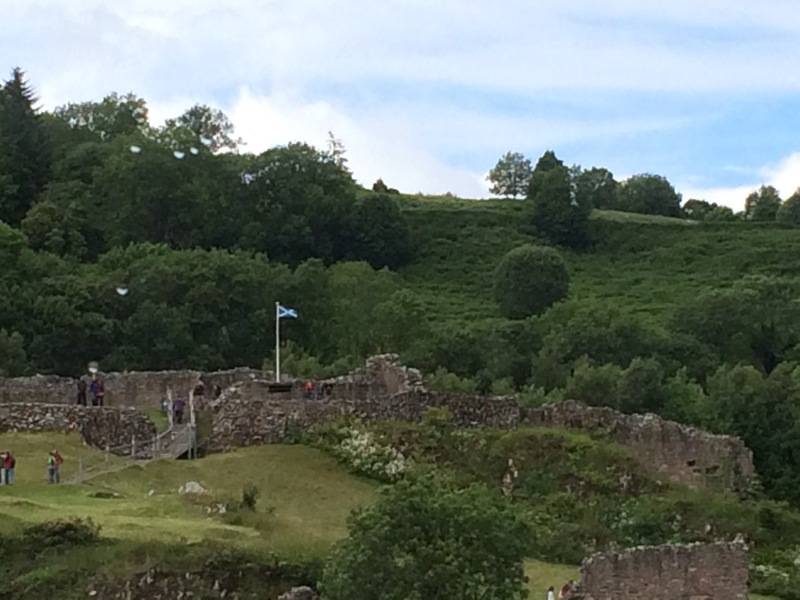 The Scottish flag still flies over the castle ruins. Take that, English! I believe their slogan was “Never give up! Never surrender!” but I might have gotten that from a movie. 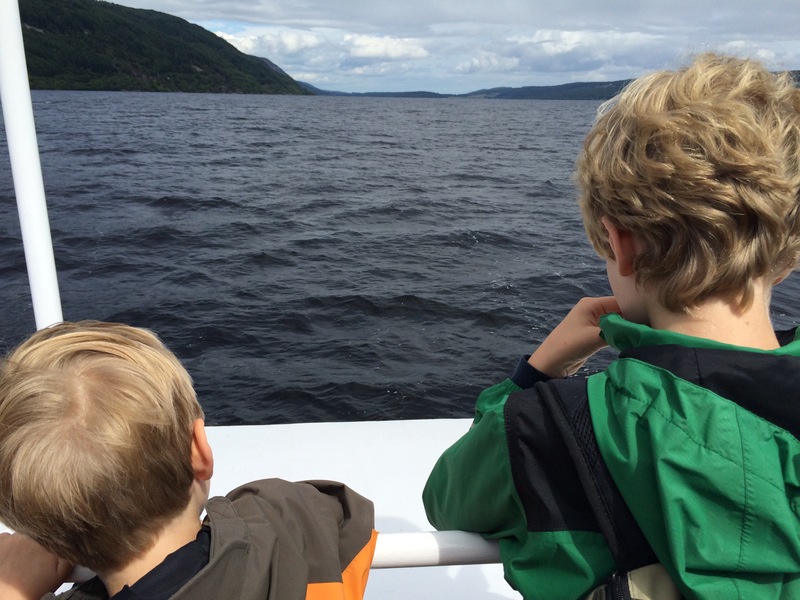 We didn’t find Nessie on the boat, but we did see what I’m sure is a totally 100% accurate representation of what she looks like. 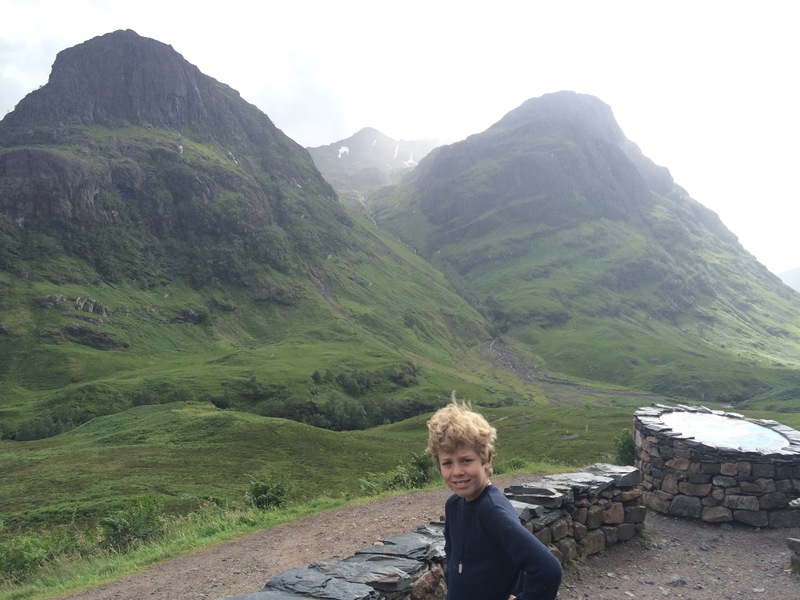 We trundled back onto the bus and went off to our next stop in the Scottish Highlands: Glen Coe. Glen Coe is famous because of its beauty and because of a horrible massacre that took place in 1692. What happened was this. The Campbell clan was working for the king who sent them to the village of Glencoe to kill the people working with the Jacobite rebellion. They took hospitality for the night with a family, then word got why the Campbells were really in town (not really just passing through) so everyone who could leave the village got the heck out, but the family with whom the Campbells were staying with had to stay or the jig was up. In the morning the Campbells killed everyone who was left behind in the village, starting with the people who gave them a meal and a bed. The people of the Highlands were outraged. To kill the people who had offered you hospitality was the worst crime anyone could think of and to this day the village of Glencoe will not allow a Campbell to stay the night there. Even the country music singer Glen Campbell was kicked out of town when he visited. 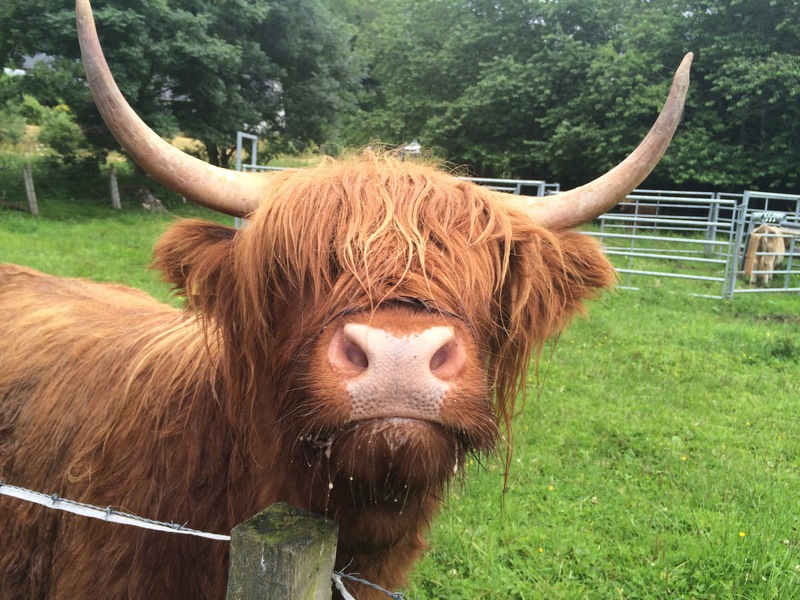 If you haven’t heard of Glen Coe you might be surprised to know that you definitely seen it. It is a very popular filming location. The Pass of Glen Coe was used as the Bridge of Death and The Gorge of Eternal Peril in Monty Python and the Holy Grail. Buachaille Etive Mòr was the backdrop for the James Bond’s childhood home in Skyfall. (Sorry to disappoint, but there is no manor house there. It was all CGI.) The area of Clachaig Gully was used for parts of Harry Potter and the Prisoner of Azkaban and there is a clearing near the village of Glencoe where Hagrid’s hut was. 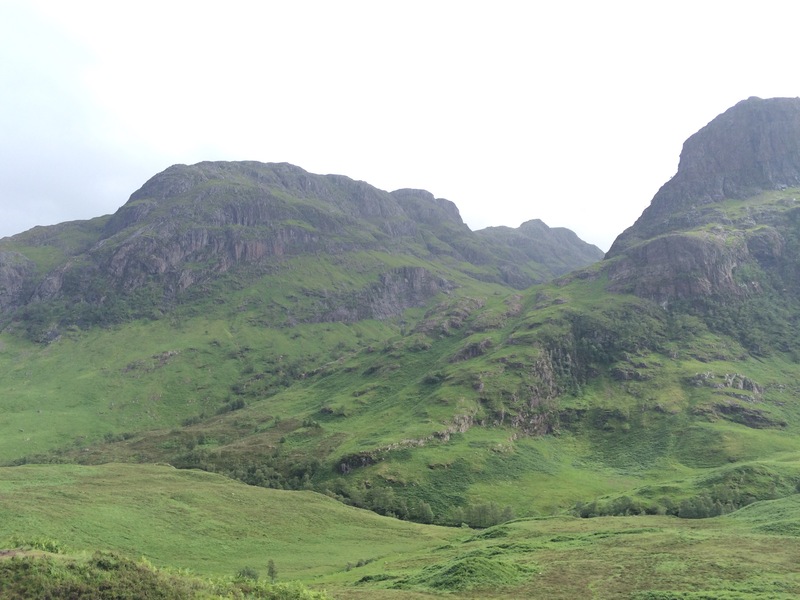 One of the more popular sights are the mountains of The Three Sisters: Bidean nam Bian, Aonach, and Eagach. We stopped there for a brief moment and I have to agree. They are beautiful. 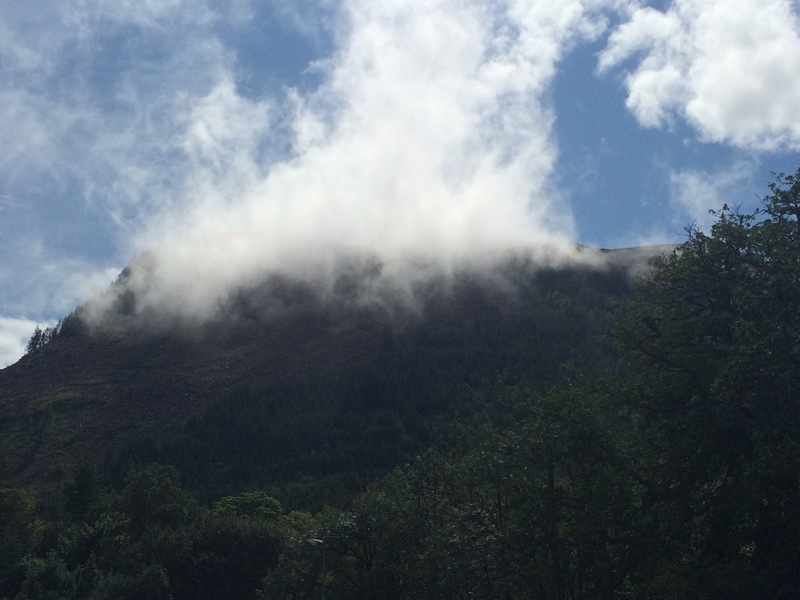 Another feature of the Glen Coe area is Ben Nevis by Fort William. Ben Nevis is the highest mountain in all of Britain and is 1344 meters tall. It is now owned by the John Muir Conservation Trust and is climbed by thousands of people every year. 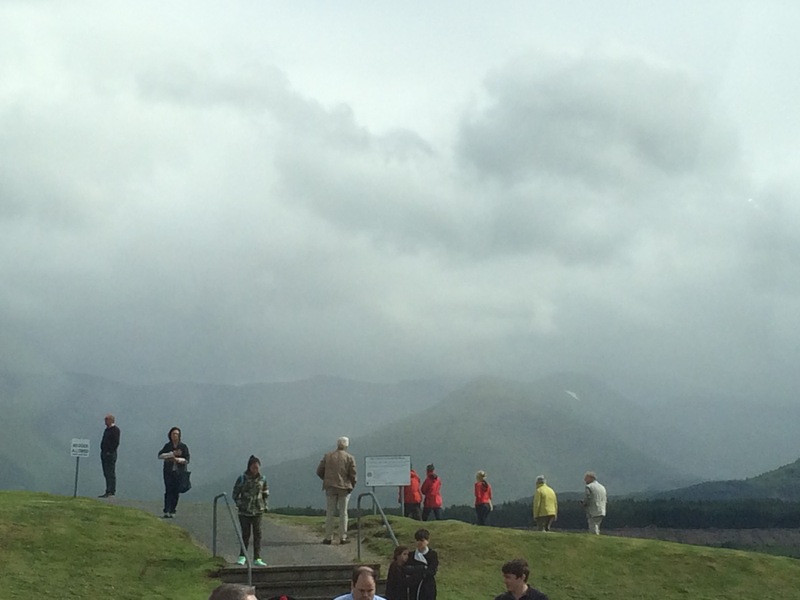 We got to see it at the sight of the Commando Memorial, dedicated to the men who fought during WWII. You don’t really get to see Ben Nevis, but I was assured that it’s out there. We drove through a lot of really beautiful country. Some people don’t like to spend so much time in a van, but for me just being taken through the countryside was a lovely part of the experience. 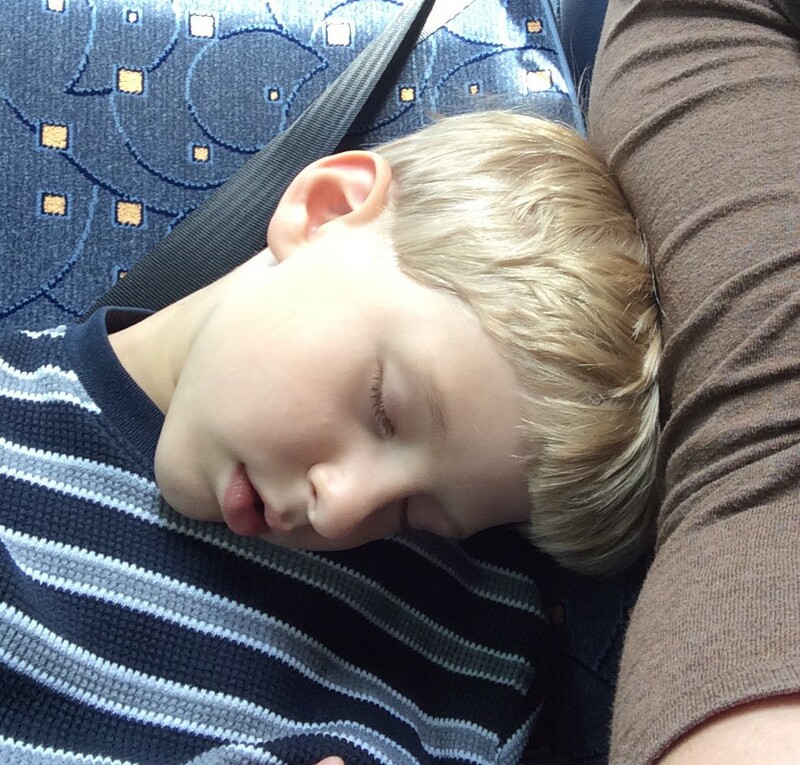 H got a little sleepy, however. As we were hurled along winding roads through some light rain and mist, our driver promised us that we would meet one of his girlfriends at the next stop. And here she is. She’s a big fan of carrots. He also took us past the castle Monty Python used for the scene where the French taunted King Arthur and told him “your mother was a hamster, and your father smelt of elderberries!” before throwing cows at him. Sorry it’s blurry. We were going over some bumps. 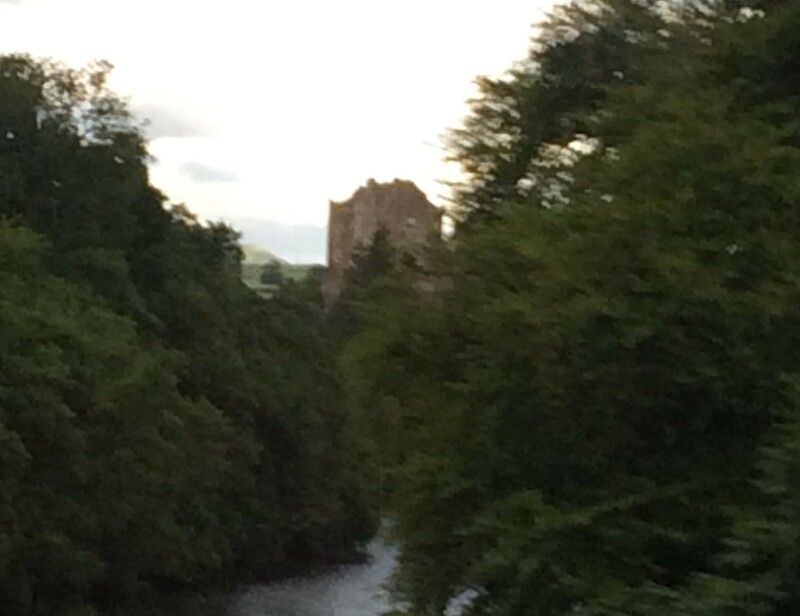 It’s real name is Doune Castle. 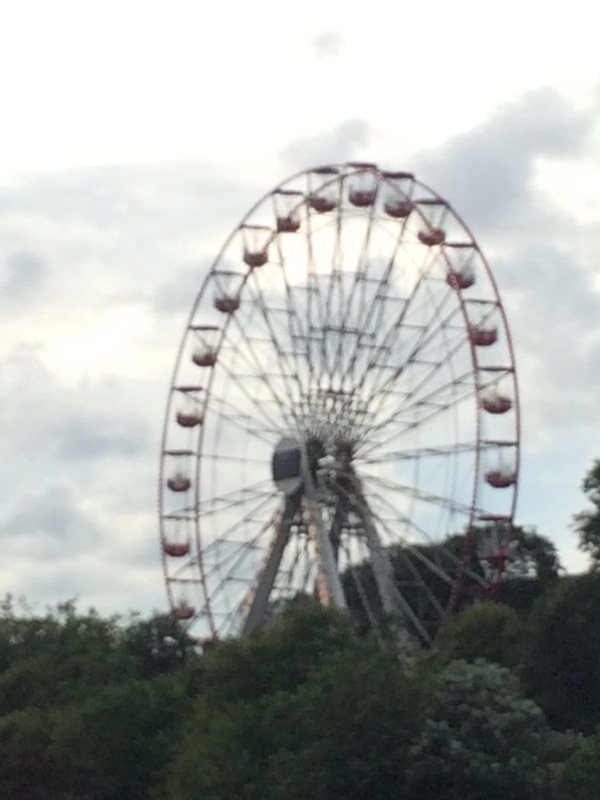 It’s quite close to Stirling Castle. It looks rough from here, but our guide assures us that it is quite sturdy and you could probably move right in. At this point in the day we had been on the road for about 10 hours. We were all exhausted and ready to get back to Edinburgh. But after dropping us off and before we headed back to Basel we visited what our guide called The Gothic Rocket. 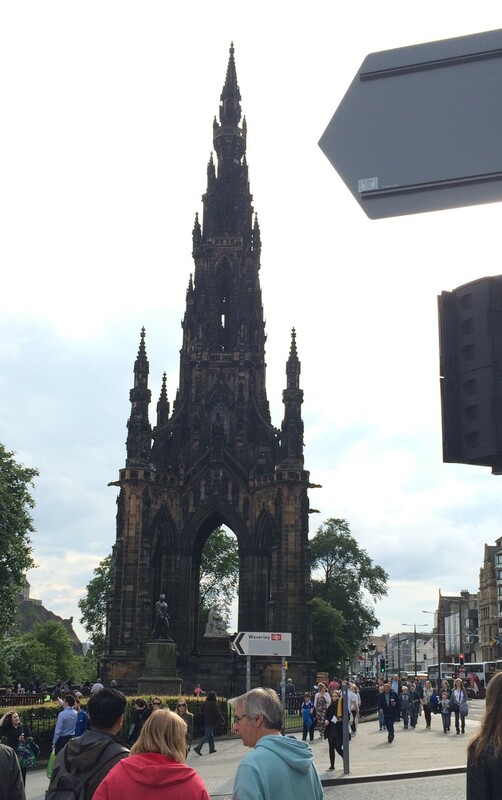 Better known as the Sir Walter Scott Memorial. I also got to meet two of the cutest King’s guards ever at the National Museum of Scotland! 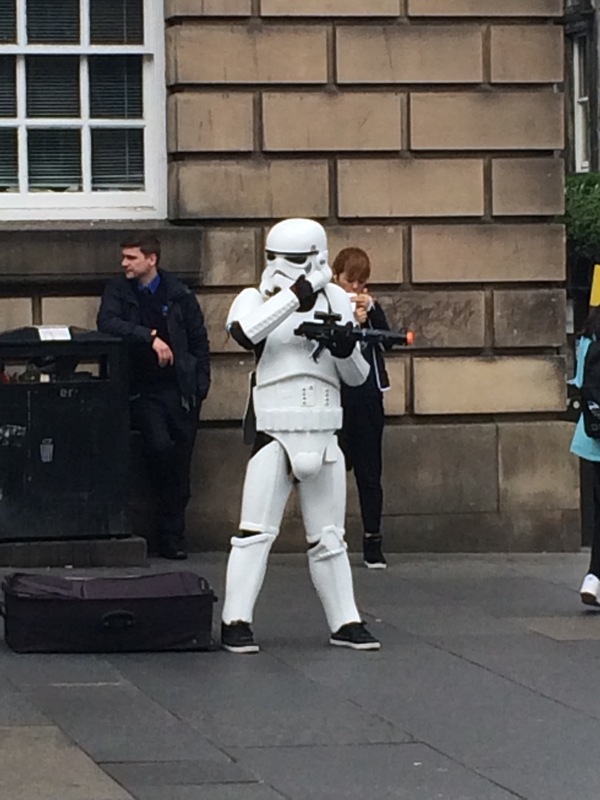 We ran into a Stormtrooper. 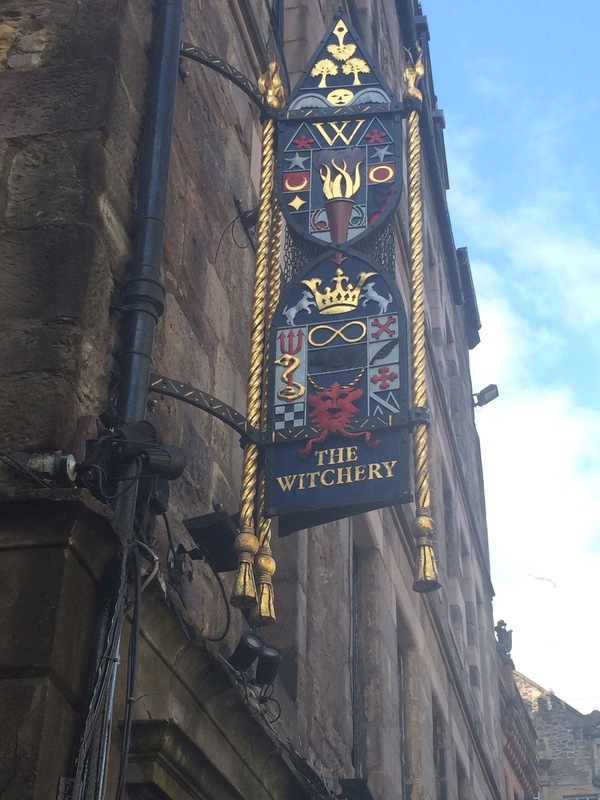 Found where all the witches hang out. And said Goodbye to Edinburgh Castle. 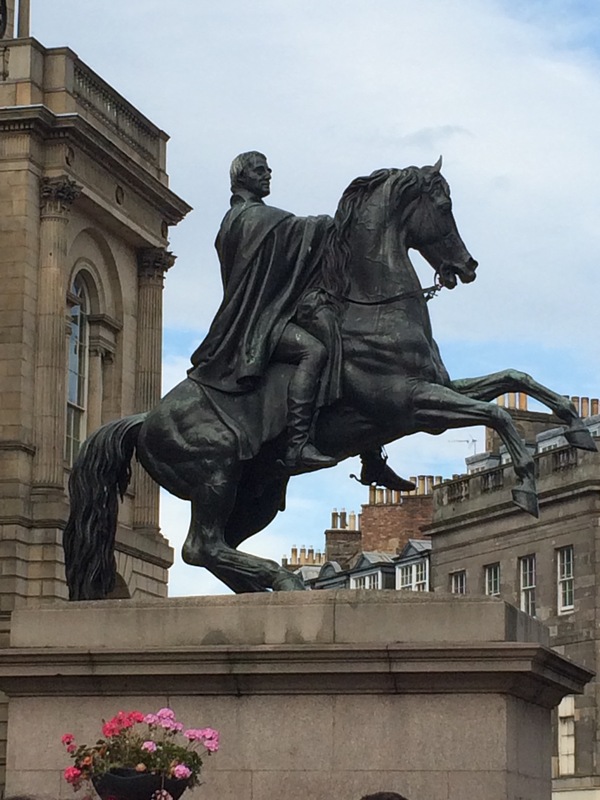 I hope you have enjoyed our trip to Scotland! We certainly did. We came home with things that are plaid, Harry Potter’s wand, Scottish shortbread, whiskey for Mark, and a desire to go back and do it all again! Next time we explore some of the Italian parts of Switzerland!